In 2000, Mayor Willie Brown, Jr. implemented the San Francisco Municipal and Transit Agency (SFMTA) Traffic Calming Program. The purpose of the program is to increase safety for drivers and pedestrians by reducing speeding, reckless driving and road rage, and traffic spillover from main roads onto residential streets. 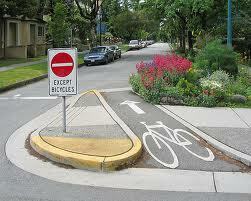 Methods of traffic calming are numerous and address specific problems. Traffic calming projects that reduce speed include traffic circles, speed bumps, narrowing roads at certain points. Other projects focus on pedestrian safety, such as traffic islands in the middle of crosswalks and bulb outs on the street corner that increase visibility and reduce the physical distance between sidewalks. The SFMTA takes certain factors into account when evaluating the feasibility and necessity of a project. These factors include requests for traffic calming, evidence of excessive speeding, traffic volume, and the relative prevalence of accidents. Other considerations include the proximity of a site to schools and tourist attractions, population density, and ensuring that traffic calming projects are spread equitably throughout the city. Residents have responded positively to the efforts by the SFMTA, which is demonstrated by the backlog of projects on the SFMTA’s plate. Requests with the required number of signatures may take one to five years to reach the top of SFMTA’s list of sites to improve. Once a request is approved, there is than a public comment and planning process that may take another two to five years. The requests have become so numerous that SFMTA is no longer accepting requests while it goes through the current list of requests and prioritizes projects. The SFMTA lists 23 current projects in the implementation stage and another 15 that are named as future projects. Funding is the key component to completing these 38 city wide traffic calming projects already in the pipeline and for numerous projects languishing on the waiting list. San Francisco has one of the highest vehicle pedestrian collision rates in the country. Seemingly endless requests for roadway improvements indicate the dangerous conditions at many intersections and high traffic areas. When an accident occurs, many injury victims sue the driver who caused the accident. However, there is another common defendant- the City and County where the accident occurred. Cities are responsible for maintaining public roadways, therefore, a city may be liable for the dangerous condition of public property if, for instance, the dangerous nature of a roadway, was a substantial factor in causing a serious injury accident. However, a government entity is not the typical defendant. In general, an injured party has two years to bring a personal injury case. When a government entity is involved, injured parties must pay attention to two different statutes of limitations. In the case of dangerous condition of public property, they have six months from the time of the injury to make a claim that substantially complies with the requirements set forth in Government Code §910 directly to the government entity which controls the property in question. The claim must be denied before the potential plaintiff may file a civil action against the government entity. The plaintiff has one year from the date of the injury to file suit. The public entity had actual or constructive notice of the dangerous condition and sufficient time prior to the injury to have taken measures to protect against the dangerous condition. This is one of the toughest elements to prove. Requests for traffic calming to the SFMTA could reasonably be considered constructive notice of the dangerous condition of roadways.The dangerous condition of some San Francisco roads not only causes disruption to residents, but also may substantially contribute to serious injury accidents. However, Government Code §830.8 states that “neither a public entity nor a public employee is liable under this chapter for an injury caused by the failure to provide, traffic or warning signals, signs, markings or devices” unless such a measure was necessary to warn of a dangerous condition which would not be reasonably anticipated by a person exercising due care. An attorney will be able to evaluate whether the controlling public entity could be liable. Even if all elements of dangerous condition of public property may be proved, the city may contend as an affirmative defense that its inaction was reasonable if it weighed the probability and gravity of potential injury against the practicability and cost of fixing the problem. A civil action against a government entity is a complex legal process, yet it may help prevent future distress to residents and visitors. If you have suffered injury as a result of the dangerous condition of public roadways, you may want to contact an attorney to see if you can recover medical expenses and pain and suffering from the controlling government agency. The Brod Law Firm takes pride in helping its clients fight against government entities and insurance companies that refuse to pay reasonable claims resulting from personal injury. Please contact us today for a free consultation.